Choice can be a double-edged sword when complexity is the opposite side of opportunity. Indeed, some education advocates in Kansas City argue that it’s hard for some families to navigate a school landscape that offers more than 30 elementary options and many other avenues for serving students. SchoolSmartKC and Show Me KC Schools are two local nonprofits dedicated to improving the education system within the city. A recent report commissioned by the two organizations — which included surveys and focus groups with more than 500 parents — found that stumbling blocks included the inability to compare academic rankings and teachers across schools, complex enrollment processes and varying deadlines in the district. But, navigating a district with so many options doesn’t have to be a challenge. National organizations have mapped out ways to make choice more accessible, and urban districts and nonprofits across the country have found ways to make the process clearer and more concise for families. Choice isn’t something that keeps families in suburban districts up at night. Many families in these communities have a choice simply because, if they don’t like their local school, they can afford to move, said Argun Saatcioglu, an associate professor of education at the University of Kansas and researcher on the report. Locally and nationally, a variety of options have emerged to serve less-affluent families living in underperforming school districts. Within Kansas City Public Schools, for instance, the district itself has expanded its offerings to include “signature schools.” Those buildings specialize in particular areas of education like: Border Star Montessori School, Paseo Academy of Fine and Performing Arts and Foreign Language Academy, which provides Spanish and Chinese immersion. And outside of the established district, there are 27 charter options for elementary school and an array of private options. In a 2015 report by the Fordham Institute, Kansas City earned a D+ for its school choice environment, ranking it 18th out of 30 districts analyzed. The report authors said that there is business support for schools and a lot of choice available in Kansas City. But they also faulted the fact that KCPS lacks a common application, charters receive less funding than district schools, and in-district transfers are available but not encouraged in any way. In general, the Fordham report recommends providing parents with better information, creating a common application system for all schools (including charters and magnets), and creating easy-to-understand school report cards to help parents navigate districts with lots of choice. Parents in the Kansas City study identified in-person visits as their top priority in selecting a school. “The ability to go to a school and visit is a key issue for parents, and they do report that not all schools are equally welcoming,” Saatcioglu said. Tricia Johnson, executive director of Show Me KC Schools, said some schools do offer open houses and tours, but they are limited and parents are “out of luck” if they are held during the day and they have to work. Johnson’s group hosts school tours allowing parents to see four to five schools and discuss their options. “People feel encouraged by meeting a school leader and feel like schools are trying to recruit them, that they want them to come,” Johnson said. A second problem parents in the study reported was the lack of a consistent method by which to measure the quality of different kinds of schools. Saatcioglu said most parents tend to want the same things — quality teachers, strong academics and safe schools. But they don’t always know exactly what defines these things, nor can that information always be easily found. Johnson’s website offers a complete listing of public and private schools in Kansas City and provides a comparison of their student scores on the state achievement test. But, she conceded, the scores are difficult for parents to comprehend and private schools aren’t required to take the tests, so most have no scores. The final major challenge for KCPS parents is the enrollment process. Enrollment for district schools begins Dec. 1. Signature, charters and private schools all have their own applications and deadlines. KCPS spokeswoman Natalie Allen said the district is in the process of creating an online platform to educate parents about their choice of district schools and is also working to streamline the application process. There are no plans to work on a common application with other entities like charters, though. According to information from Show Me KC Schools, there are 24 different enrollment dates for all public and private schools in the district spanning from the end of the calendar year through August. Other districts around the country, along with nonprofits, have created systems meant to improve school choice. One of the cities is Chicago, which has a locator to help parents find school options. In San Antonio, the nonprofit Families Empowered offers a website explaining options to parents, helps them find schools and hosts school fairs. 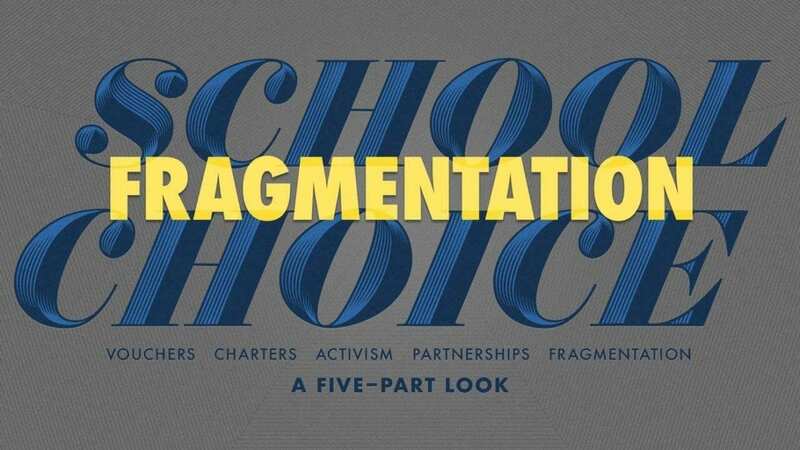 And in Denver, where students can go to neighborhood schools or various other options, the public school system created SchoolChoice, where parents are able to get information on almost all district schools, including charters and magnets. Parents can use Denver Public Schools guidebooks or the website School Match, which takes families’ location and educational preferences and provides a list of possible schools that fit their needs. The district also hosts a series of evening expos where parents can find out more information on the various DPS schools. Once parents have chosen the best schools for their children, they submit one application form ranking their top five choices in late February. DPS then matches students with their school and notifies the parents of the child’s assignment in April. Back in Kansas City, Johnson is planning to expand her organization’s school tours to include more families, and she said they would like to host a district school fair. They are trying to provide more one-on-one support for families and may be making staff available in area community centers and libraries to provide information on school options. They also have a printed school guide coming out soon for people not as familiar with the internet. Editor’s note: Awais Sufi and Tricia Johnson are members of KCPT’s Take Note advisory committee. Follow “Take Note: Our City. Our Schools. Our Future” as together, we tell the stories that matter, the stories that make an impact. We want to know — what stories do you have for us, and what can we find out for you? Email us at contact@takenotekc.org and follow the entire project at takenotekc.org.